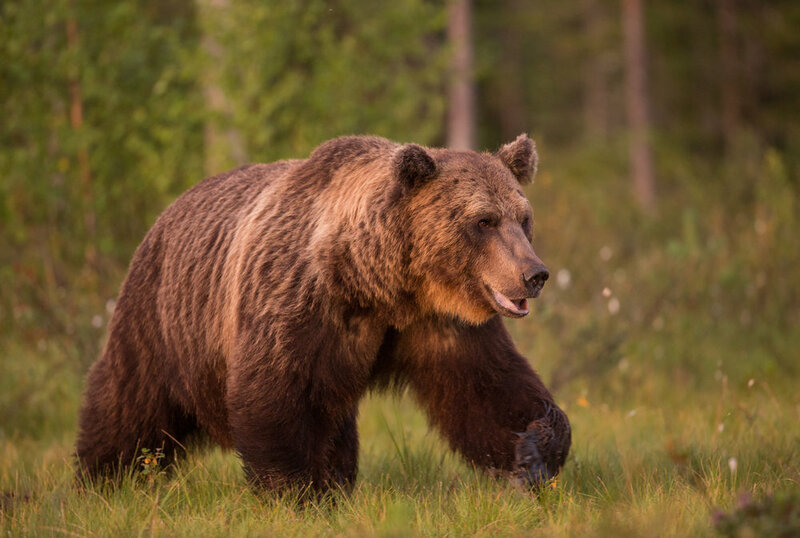 Join the BearPhoto team in June 2019 on our Finland Brown Bear photography tour ‘Land Of The Midnight Sun’. We welcome you to join us on an exclusive trip into the land of the midnight sun, as we stake out Europe’s greatest predators. Experience the magical Scandinavian midsummer, with close to 24 hours of daylight, participants can expect extended unique photographic opportunities in peak bear season. Finnish summertime signals the arrival of long daylight hours, bringing magical light and crisp green vegetation across the boreal regions. Bear activity is high during this time of year, and beautiful summer light allows a range of unique images. Warm days and cool nights bring with them ghostly mist, which slowly forms above the swamps. It is here, where the ghosts of the forest appear most at home, as many different individual bears are regularly present in the area. Birds and insects are present, and plants are in bloom as the swamps are laden with delicate cotton grass. Wolverine are a frequent visitor to the surrounding landscape, and breeding birds such as Red-Throated Diver, Greenshank and Goldeneye are also regularly present. We are the official UK representative of Wild Brown Bear Ltd, sharing a close-knit partnership, allowing us to develop exclusive photographic opportunities for tour participants only. We are the most experienced photographic guides at this location with valuable local knowledge. Our energy and enthusiasm create a fun and productive trip atmosphere for all involved. We know exactly which hide to position you in to capture your desired images. Two guides mean more one-to-one tuition and guiding in a more intimate setting. We are dedicated to getting the absolute most out of our tours for you, providing an unforgettable experience. 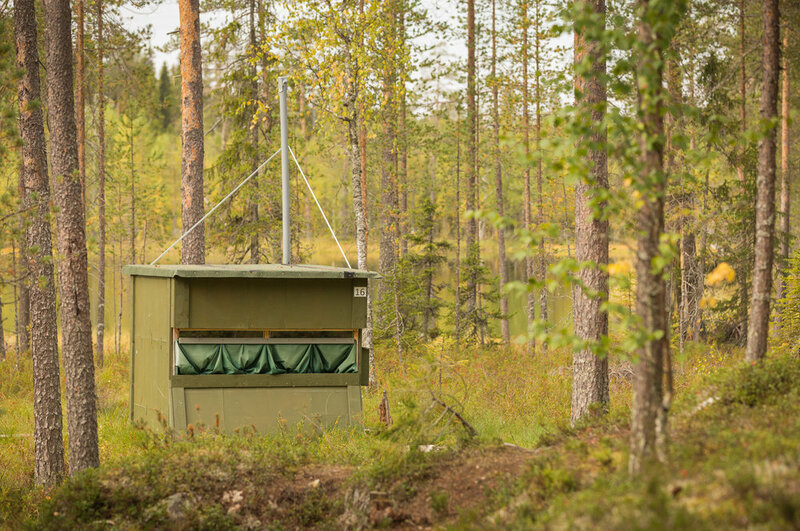 Our location boasts some the most unique and pristine Finnish wilderness situated next to the Russian border, where elusive apex predators (Bear, Wolverine and Wolf) can be seen together. 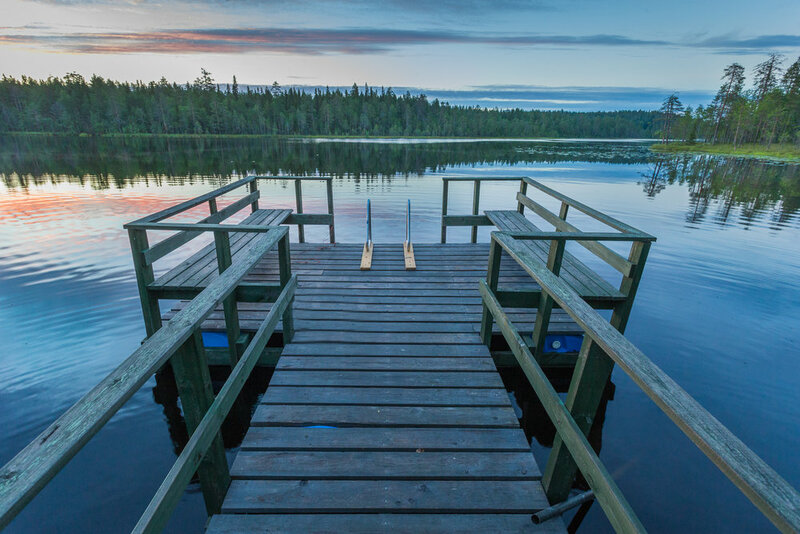 Our base for this trip is a rustic wildlife lodge located in the picturesque surroundings of the Boreal forest in midsummer. 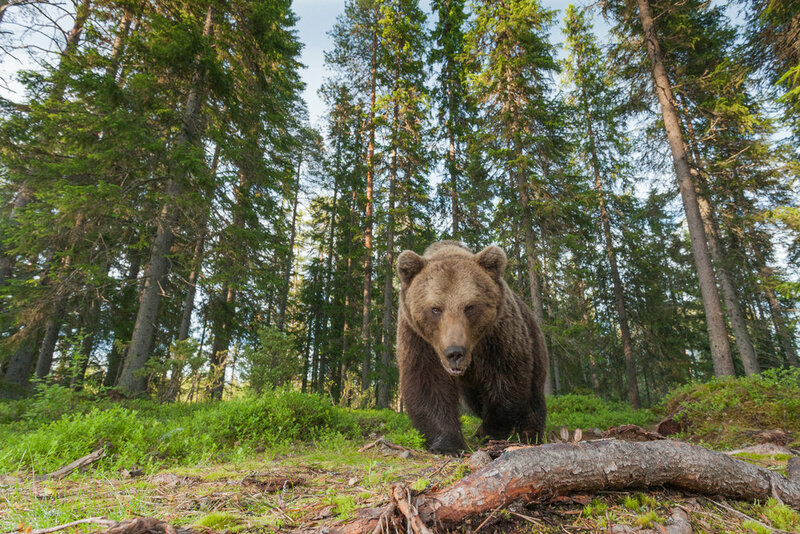 This is one of the best locations in Finland to observe and photograph Brown Bear and Wolverine among their natural habitat. This package includes five nights in professional bear photography hides, custom built and carefully positioned, with photographers in mind. We offer you a choice of 25 different professional hides, all with a different view of the surrounding wilderness. A number of hides have been installed with state of the art low angle shooting windows, allowing an optional fresh and intimate perspective with images. You will have the chance to photograph the predators among three different distinctive Boreal habitats, including forest, swamp and lake. The wild landscape is totally unique to this site and will allow you to photograph predators in a number of ways. With reflections possible at the lake hides, to the cotton grass covered swamps and ancient boreal forest the bears call home. The opportunity to photograph bears during midsummer is very special. We are incredibly fortunate to work in this location, allowing you the opportunity build a unique portfolio of images. Day 1: We will arrive on an afternoon flight at Kajaani airport via Helsinki, where you will be met by the BearPhoto guides. A 2-hour transfer will follow, taking us to the Wild Brown Bear lodge where we will be based for the duration of the tour. Dinner is prepared for our arrival. After dinner, we will meet in the auditorium where the BearPhoto guides will deliver a short presentation detailing the week ahead. Our first night will be spent resting in our accommodation, after a day of traveling. Day 2-6: Breakfast will be served early on, followed by a period of free time to spend as you wish. BearPhoto guides will prepare optional daytime photographic opportunities including forest birds and red squirrels. Feel free to explore the surrounding area, during the day as you wish. Before dinner, participants are welcome to attend our informative photo lectures. Dinner will be provided shortly after this around 4:00pm. before your guides will lead you to your chosen hides for the night at 5:00pm. A packed lunch, flasks (tea/coffee) and bottled water will be provided for each individual whilst in the hide. Following a short walk, upon entering the hides it is simply a case of setting up, getting comfortable and waiting for the first Bears and Wolverine to appear. Each hide is equipped with beds and a basic toilet facility. The following morning you will be escorted from your hides by the BearPhoto guides at 7:00am, followed by the short walk back to base camp where breakfast will be waiting. The following days and hide nights will all run in a similar pattern. Day 7: This is the final day of the trip, and upon leaving the hides at 7:00 a.m. you will be guided back to basecamp one final time for breakfast. 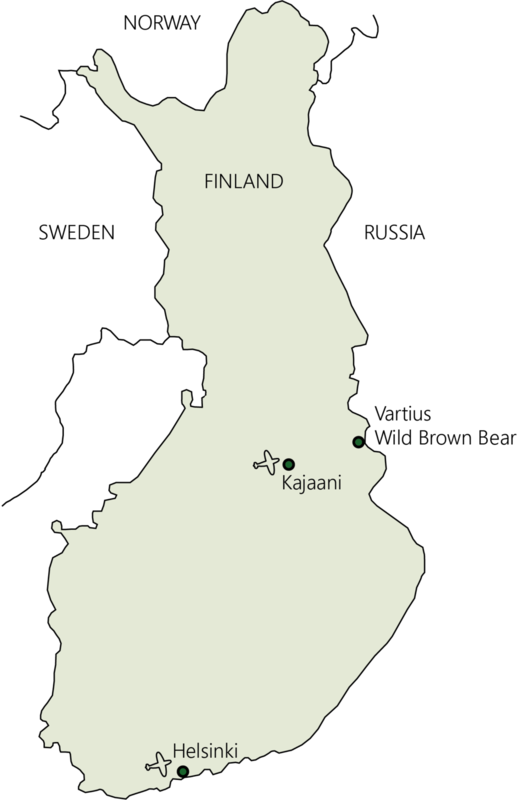 We will have just enough time for a shower and any last minute packing that may be required before our minibus arrives to transfer us back to Kajaani airport for our flights home.